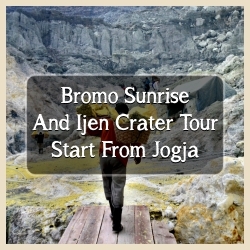 After exploring Mount Bromo and sunrise scenery, the next tour is the Ijen Crater tour. Ijen Crater is a tourist spot with the attraction of domestic and foreign photography enthusiasts. Mount Ijen is one of Indonesia's volcanoes which is still active with strong sulfur odor. But this situation does not frighten travelers and photographers down to close to yellow sulfur and see mine workers. Pick up at 07.30 am (depend on your hotel location) go to Probolinggo by Minibus with Air Con, it's take around 12 hours (if no traffic jam). You will be picked up from Ngadisari at 03.15 am or Cemoro Lawang at 03:30 am by JEEP to Penanjakan view point to see the sunrise. Leave Penanjakan at 06.30 am and go to Mt. Bromo by Jeep. The Jeep will be stopped at Parking area, so you must walking to the Bromo caldera. From Sempol Village, you will be picked up at 04.00 am, you have to get up earlier for breakfast and check out from the hotel, then go to Paltuding post. Paltuding post is the post to starting point of the trekking. Start trekking at 04.45 am for 3 km, it takes 1.5 hours to Ijen crater. You have around 3 hours in Ijen crater. Then leave Ijen crater at 07.30 am and back to Paltuding post to take a rest before going to Ketapang Harbor by minibus. Almost Hotels in Bromo area and Ijen do not have a good rating, please prepare yourself for this!